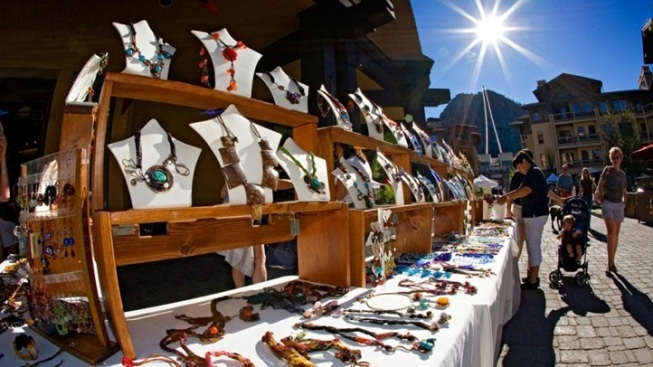 Stroll by handmade gifts and more goodies, all while soaking in the alpine air. The Art, Wine & Music Festival spreads out at The Village at Squaw Valley on July 11 and 12. THOSE WONDROUS WORDS: What are some of the terms we often use to describe strolling in the soft sunshine of a July morning at a higher elevation? We might call the air "clear" or "crisp" or "invigorating" or "cloud-drifty" or even "lemonade-like" if we're feeling especially poetic. But getting to that pretty walk, when so many workaday tasks call us, and so many emails cannot be put off (or so we say), is the task at hand. Having a goal of sorts is sometimes key, though the most practiced of outdoors-enjoyers know that no goal is required to getting out and getting some sunshine. That lemonade-like, cloud-drifty air is intense and at times intoxicating around Lake Tahoe come the first stretch of summer, before hints of autumn come a-callin'. And it makes it a grand time for an artisan-focused art-plus fair that has a focus on local beers, local tunes, local creative types, and an important cause to support: Tahoe non-profit Disabled Sports USA Far West. The fair is the Art, Wine & Music Festival at Squaw Valley, and it is ready to stretch in the lemonade sunshine, most languidly, over Saturday, July 11 and Sunday, July 12. 30 ARTISANS... will table up The Village at Squaw Valley, so come prepared to shop and browse jewelry and wearables and artworks and the other made-by-hand things that come with a lot of local Tahoe cred. There shall be live tuneage -- Calling Ophelia and Tim High will be on the stage, among other performers and bands -- and there shall be kidly creative activities (and some for the adults, too). Plus an "unlimited wine tasting" from some 20 wineries. (Get your glass for twenty five bucks when you get there). COST? It's free. Enjoying chatting with people who made the goods spread out before you? Also free and a rarer pleasure. Savoring that high-altitude-y, alpine-sweet sunshine, the kind that only comes around in July in just a few places, Tahoe being one? So sweet. You could spend all of your non-browsing, non-beer-tasting time fully basking in its crystal-twinkly rays.